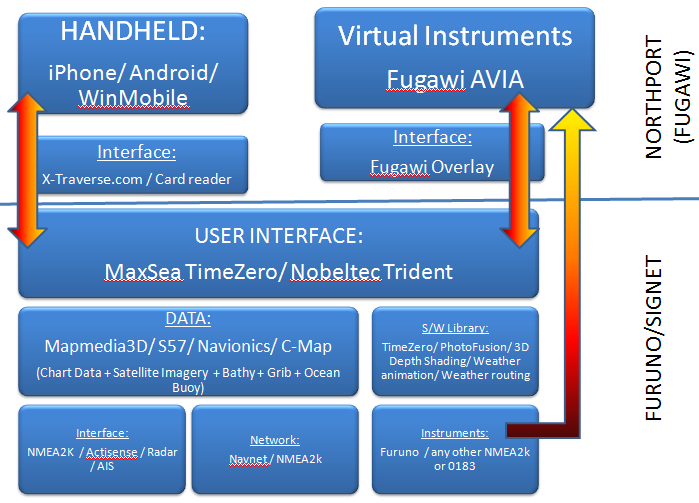 To my knowledge ActiveCaptain was the first to build a UGC (User Generated Content) product independently of any mainstream supplier of maritime chart plotters or related product. Using this platform you can record local data like Rocks, Wrecks, Obstructions, Buoys, Beacons & Signs, Lights, Shops & Repairs, Ports & Marinas and Anchorages, Moorings and even upload your recommended routing and waypoint data. I believe that ActiveCaptain is also the most successful. Although there is a preponderance of Stateside data, I and many other UK sailors have been uploading data for our local marinas, routes and other useful info about sailing in UK waters. I encourage you all to participate in this platform – it is cheap and you can only gain from the wealth of local knowledge that is already, and will continue to be, stored on this platform. 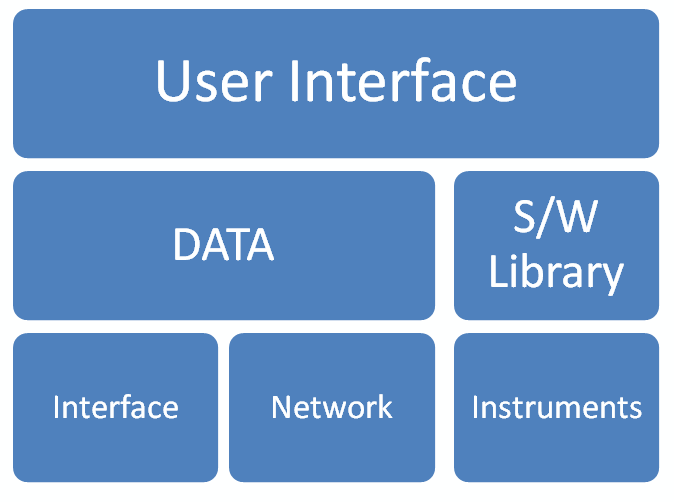 Obviously to make it easy to benefit from the UGC layer, it is essential that you can easily integrate access to ActiveCaptain from within your chosen chart plotting software and that the data remains accessible when you are offline or unable to connect to the internet. One of the most important products to do include such integration to ActiveCaptain was the MaxSea TZ product that I reviewed extensively here. I jumped in and bought the iPhone app from Navionics pretty early on because it was the brand I used on my fixed Raymarine chart plotter and because they had a UK chart version available for only GBP14.95. The chart plotting software is Navionics Gold UK/Holland and it works perfectly well on my iPhone, but unfortunately for me it has its own UGC layer (User Generated Content). Strangely you have to submit additions to their UGC layer using an online form on the Navionics website and it is not integrated with another product other than Navionics own chart plotting software – so why bother with their own, limited, UGC community! Russ June 1st, 2011| 2 comments - be the next!|Tags: activecaptain - android - coastal explorer - iphone - MaxSea - Navigation - Navionics - ugc. 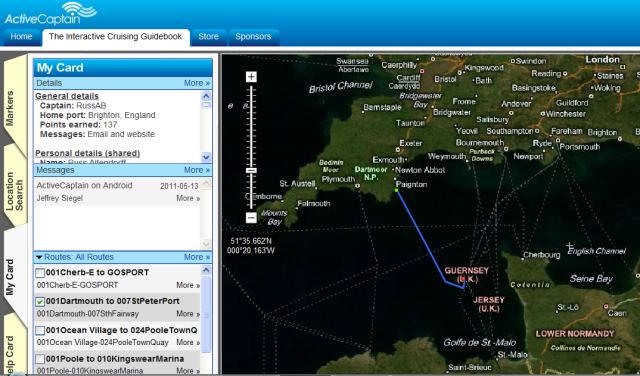 For some time Fugawi has produced a perfectly good piece of navigation software Fugawi ENC. I must confess I have not had time to review it in detail, so much time was spent with my 7 part optimal routing series last year and with testing MaxSea TZ in action. Who owns Fugawi? – well in January, software manufacturer Northport Systems that owns Fugawi and X-Traverse.com (the online chart subscription service) announced that its president, Robin Martel, had acquired the company. Robin Martel took over as the owner of Northport after having joined business development manager in 2002. He became the company's president three years later. Prior to joining Northport Systems, Martel co-founded and led New Zealand-based GPS Control Ltd., working as its managing director and technical manager; held directorial positions with Pico Data Ltd. and Expressway Group Ltd.; and was the marketing manager, sales engineer and IT manager for Geo-Systems Ltd.
Northport Systems began operations fifteen years ago. Its first product was the affordable Fugawi-brand mapping software for GPS receivers, which allowed customers to scan and calibrate their own map images for use with early GPS handheld devices. The company has since expanded both its customer and product base, and now offers a selection of GPS-related software products for land, marine, commercial and military applications; as well as an extensive line of digital maps and charts for regions throughout the world that are available for instant download from X-Traverse.com to a wide variety of PC, Mac, iPhone, Android, Symbian and Windows Mobile devices. With its desktop, mobile and web-based navigation and mapping software products and services, available under the Fugawi, X-Traverse and third party brands in over 130 countries, Northport Systems enjoys a worldwide reputation as a leader in GPS mapping software and innovative GPS applications. Handheld/Mobile Device Expertise – So Northport/Fugawi has a great track record in getting digital charts and charting software on to a very large variety of GPS enabled handheld devices and smartphones. Its X-Traverse.com is a web service that allows you to transfer your digital map data and personal Waypoint, Routes, Tracks and POI to and from your PC, iPhone, and other mobile devices. Northport/Fugawi have already proved their skill with the excellent $129 NavPlanner2 which is bundled with Navionics Gold charts of the entire U.S. plus the Northern Bahamas, and a Navionics card reader. The software also has GRIB weather file overlay facilities and it includes even more U.S. freshwater data than HotMaps (17,000 U.S. lakes on a $20 DVD! ), with all of Navionics High Definition lake surveys. This is a great planning tool from which you can transfer routes to most your plotter using cable, card, or Internet. NavPlanner2 supports Waypoint, Route and Track transfer export to: GPX, Google Earth (KML or KMZ), ESRI ShapeFile, Fugawi or ASCII Text. It is also compatible with MuskokaTech's PathAway GPS Software for Windows® Mobile and Nokia/Symbian operating systems. It can be used with Fugawi's X-Traverse to transfer data online with iNavX or iMap on an iPhone or iPad, Facebook, and more. All the transfers are two way so you can use NavPlanner2 to collect and enjoy tracks you made on all sorts of devices. 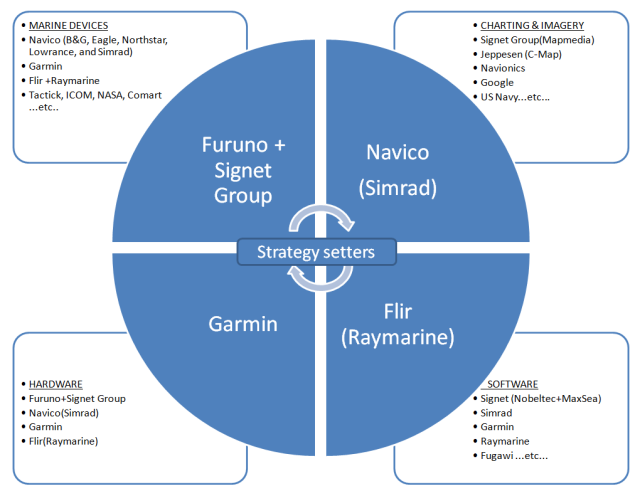 Strategy – So following the thread I began about strategic trends in marine electronics and the posting about the structure of modern chart plotting software which looked at the products coming from the Furuno/Signet stable (MaxSea TZ and Nobeltec Trident) – its seems perfectly sensible that Robin Martel should be talking to these guys about joining forces. Now please note I have no idea if Robin is doing this – BUT I would be delighted if Northport would bring their the undoubted expertise in the mobile arena, and the brilliant glass bridge AVIA series of products, into the fold. The North Vancouver based Avia Design Group Inc. is the producer of the Avia Sail and Avia Motor line of virtual instrumentation products for NMEA 0183 and NMEA 2000® networks. And Northport appear to have an exclusive distribution agreement for this product line. Of course as the diagram illustrates there is nothing to stop you doing this right now. 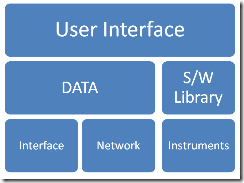 All the elements of the software and hardware interfaces are on the market right now and all will work together using the important glue of X-Traverse.com at the software/data level, and Actisense at the hardware level. In the meantime Garmin, who is pretty much a go it alone type of company building their whole stack of products from the hardware upwards, is going to have their work cut out. As for poor old Raymarine – well readers of my previous postings know what I think of their strategic thinking! – as I have said before, good luck FLIR ! In my next post I will look at the Fugawi AVIA product line – very exciting, and its not just a pretty face! Russ March 9th, 2011| One comment so far - be the next!|Tags: Fugawi - iMap - iNavX - Navigation - Navionics - NavPlanner2 - Northport - strategy - X-Traverse. 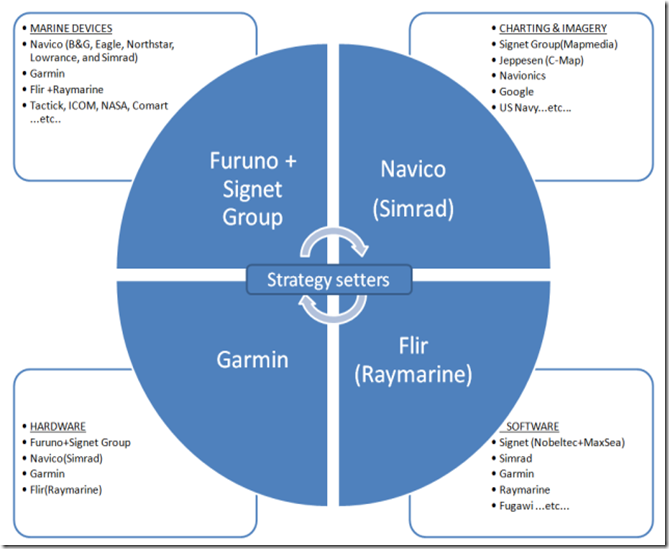 Following on from my previous post on the growing monopoly power in the marine electronics industry and its impact on consumer choice I though I would illustrate my arguments using the excellent new releases from the Furuno/Signet empire. Firstly, make no mistake the Furuno/Signet empire is going to make a very significant impact on the marine industry, and I think in the short to medium term at least this will be a good thing judging by the quality of their strategic thinking and their product launches so far. 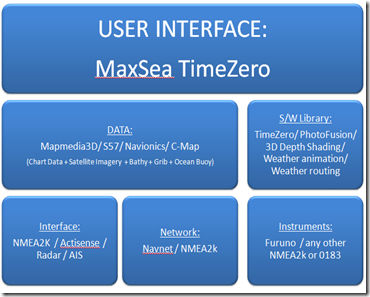 Last year MaxSea launched the brilliant TimeZero software that I reviewed extensively in my 7 part series on Optimal Routing. 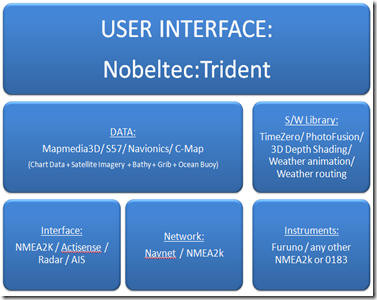 Now (February 2011) Nobeltec has released its Trident software. Two product launches from two different companies that have loyal and extensive customer bases. You may recall that the Nobeltec customer base was irate and despondent when Nobeltec was sold off by Jeppesen in 2009 to Signet – they thought that was the end – but it was not so. The Furuno-Signet team are smart! Instead of alienating thousands of customers they have wowed them all with two brilliant bits of software….and by doing this by re-using fundamental components much like the big car manufacturers do. This technique means that products can be made with greater standardisation and therefore reliability, be enhanced more easily, and produce greater return on investment thereby attracting increased future investment. 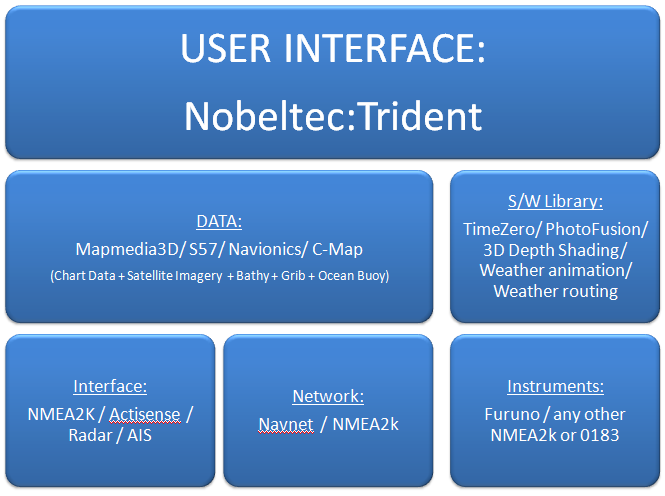 At the time of the release of the Nobeltec Trident software in February there were dozens of press releases being repeated all over the blogosphere and marine industry mags that went on and on about this feature and that feature. I am sure you can all remember the press releases for MaxSea TZ from 2008/9….Doesn’t this sound exactly the same? There is a reason for that. All the features listed are the exactly the same because they all come from the same library of software functions that the excellent developers at Signet (MaxSea) are responsible for – presumably under the watchful eye of Brice Pryzo. Only the user interface is different. This should pacify the loyal customer bases of Nobeltec and MaxSea while allowing innovation from the competing development teams at MaxSea and Nobeltec. The user interface can diverge and have different novel ideas added while maintaining a high degree of reliability and maintainability through the use of the same fundamental software libraries. In fact when you install MaxSea TZ on a PC – and I guess the same is true of Nobeltec Trident – you also install a heck of a lot of Microsoft database software and other Microsoft support libraries too – many Gb’s in fact! so make sure you have plenty of disc space. This is the way to make critical software more reliable and yet to allow for developers to innovate with the user interface. This is a great strategy. Yes I do know that MaxSea has other software on the market at the same time (Navigator; Racing PRO; X7; Commander; Explorer; Professional) and so does Nobeltec (Nobeltec VNS and Nobeltec v12). Well there is plenty of room for all these products and one will suit a particular sailor more than another. For me it has to be software based on the TimeZero technology however. Having used it extensively last year on sail yacht; power boat; and a 55ft steel coaster sailing from Liverpool to Lowestoft, I do think it is far more friendly, and the ability to instantly switch between vector and raster charts is fantastic. I am convinced that this is the technology strategy that will win the day ….. it is so reminiscent of Windows v CPM from the 1980’s PC industry – no contest. 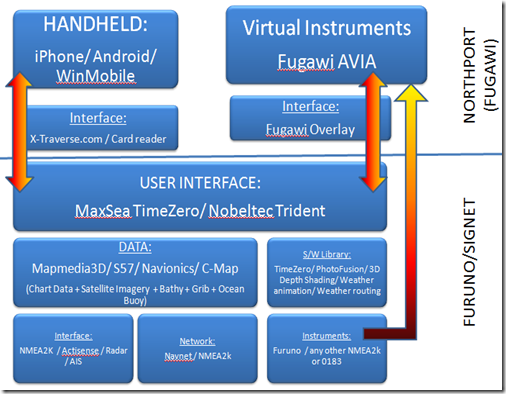 Now what I would like to see is Fugawi joining forces – and bringing its X-Traverse and Avia Instrument Interface into the game…now that really would be a basis for some fantastic products! Russ March 8th, 2011| No comments - be the first!|Tags: Avia - Fugawi - Furuno - MaxSea - Navigation - Nobeltec - Signet - TimeZero - Trident - X-Traverse. Glass bridge or Glass House? We appear to be edging ever closer towards a complete glass bridge system – even on sailing boats. This concept not only means that instruments can be portrayed in a myriad of forms; combined with each other in a myriad of ways; but they can be displayed on any device that will accept the NMEA2000 protocol and run the appropriate software – so that means flat panel displays; handheld devices like iPads; smartphone like iPhone or Android based phones – and who knows what next – all sharing data in real time! The glass bridge concept also allows the integration of disparate systems such as navigation instruments and data; fishfinding data; other instrumentation such as engine data; multimedia entertainment; and onboard cameras and even internet browsing/email and so on. One essential prerequisite for the concept to work is fast data networking, and so the marine industry has, as you know, started to implement the Ethernet standard for networking and leave the old NMEA0183 behind. Well, as you probably also know, the certain marine suppliers have been up to their old tricks and have decided to implement non standard versions of NMEA2000 – sigh. Lets pretend for a moment that NMEA2000 is implemented well. Then being able to share data between devices like iPhones and Chart Plotters and engine monitors should be as easy as plugging in a cable and installing the appropriate device driver – as you would on your laptop with a USB device – and we all know that that always works too! So what we have here is a wonderful concept – but, the suppliers are all determined to provide their own fully integrated portfolios of hardware, cabling/connectors, interfaces, and software so that there is as little chance of interoperability as possible. I don’t hold out much hope that the marine industry will ever agree on, and maintain standards – why should they? That would only reduce their market share and increase competition. As you can see and IMHO, there are relatively few companies that really control the trends and the innovation in the marine electronics market place. The multiplicity of brands will continue simply to give the poor boater the feeling that there is real choice. The recent announcement that Nobeltec’s Trident software is based on TimeZero technology – the same technology that is the foundation of MaxSea software – shows how their holding company can squeeze as much competitive advantage as they can from their innovation. Who can blame them for that. Russ March 7th, 2011| 2 comments - be the next!|Tags: glass bridge - Navigation. Active Captain Bargain for Cyber Monday 2010…. 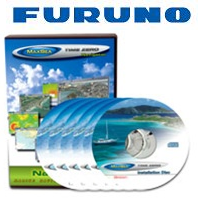 Not to be outdone by the many online deals going on today, MaxSea and Furuno have teamed up with a great deal of their own, a rebate on purchases of MaxSea Time Zero Navigator software. 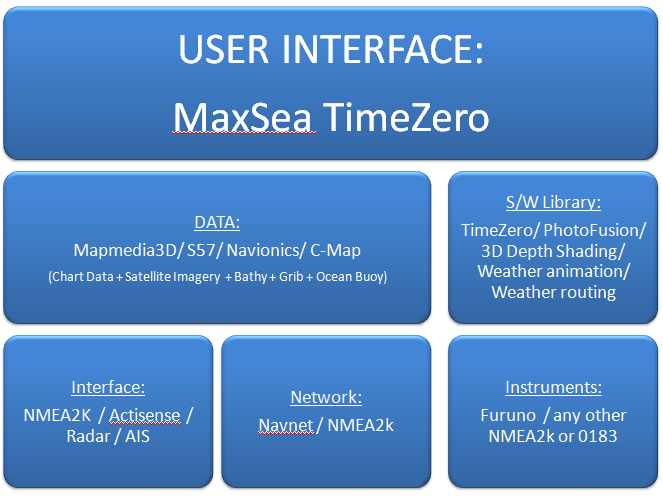 If you purchase MaxSea Time Zero Navigator between October 27, 2010 and March 15, 2011, they will provide a $100 rebate. You must fill out and return the rebate form. The rebate form can be downloaded here. With this rebate, the effective price of getting the full software with all US NOAA charts (vector and raster, 3D data, satellite imagery) and ActiveCaptain offline overlay support is only $239. There is no one who offers a lower price for this product and it’s now $100 less. For non TimeZero software see this comparison chart – and for TimeZero software see here. I have been using MazSea TZ Navigator with the routing and weather options all last season and I planned on writing up my findings – but – well time has eluded me….er, having too much fun! Russ November 29th, 2010| No comments - be the first!|Tags: MaxSea - Navigation - Routing - TimeZero.